Award Winning! Ole Man's Spice Rub & Seasoning Gift Pack-Special Combo! Award Winning! 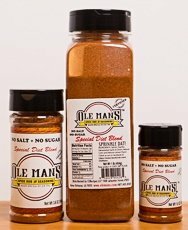 Ole Man's Spice Rub & Seasoning Gift Pack-Special Combo! by Unknown at The Flavour Stack. Hurry! Limited time offer. Offer valid only while supplies last. Our newest blend has bold,intense flavors with the surprise of NO SALT and NO SUGAR. You have never tasted anything this good for a no salt blend. Our newest blend has bold,intense flavors with the surprise of NO SALT and NO SUGAR. You have never tasted anything this good for a no salt blend. Don't miss a chance to try our Award Winning Dry Rub/Seasoning-This size is great for family baking or grilling! You will not run out to soon and you will make your every meal one to remember. Add Ole Man's Spice Rub & Seasoning to your brisket, ribs, pork chops, hamburgers, turkey, game, fish, and vegetables. It even tastes great in beans, dressings, soups, potato salad, and mac & cheese. Ole Man's Spice Rub & Seasoning is so versatile that you will find it a necessity to limit the quantity of spices in pantry. It is a perfect solution to all your favorite recipes. It will allow a busy family to prepare a great meal in minutes with a well-seasoned blend with low salt, Gluten free, and No MSG. WE ARE PLEASED TO ANNOUNCE OUR ETSY BLOG FEATURE HANDMADE PORTRAITS: OLE MAN'S SPICE RUB & SEASONING! PLEASE CHECK IT OUT!!! http://www.etsy.com/blog/en/2012/handmade-portraits-ole-man-rub/ Multiple Award winner for the prestigious 2015-2018 for the World Hot Sauce Awards, Scovie Awards, Fiery Food Awards and People's Choice Awards Once you try our spice you will love our seasoning for all your meals. Just remember to "Sprinkle Dat!" We have new 2018 prices.